If you don’t want to mark up your character cards, put them in a penny sleeve and use a fine point sharpie to mark on the sleeve. 3) Lem is a follower – not a leader Lem and Harsk make a good team up. Harsk can hold his own when exploring and then scouts the next card in the deck. Our Harsk usually announces what he sees (in a whisper as any ranger would do :)) and then if it is Lem-able, Lem bats clean-up. If not – Lem usually heads over to a ‘safe’ zone and loots. He can usually pass most loot/spell rolls so he makes for a handy backpack until QuestEnd and it gives him a little more card HP for the current adventure. Exploration is the key to success in this game, yet I’ve played some games where we’ve run out of turns in the blessings deck before winning, simply because people were being overly cautious and not exploring additional times on their turns. While you obviously don’t want to discard yourself to death, you should have a compelling reason not to explore additional times on your turn (such as knowing what is next in the location deck and knowing you can’t pass the check, or REALLY needing the boost that ally or blessing will grant for a specific check), especially in games with more than a couple of players. The more players there are, the more locations there are to close, but you still only get the same 30 turns, so you really have to make the most of each turn. Don’t get careless and get yourself killed, but also don’t cost the whole party a win because you were too cautious. P.S. There is an often misunderstood rule that says a single effect only nets you a single additional exploration regardless of if it triggers multiple effects that would grant additional exploration. This does NOT mean, however, that you can only explore one additional time each turn. You simply have to come from separate effects for each additional exploration. Let’s face it, although very well designed and generally well explained, the fact that this game lets you do such a variety actions, well, things bogus in the rules are bound to happen. Paizo compiled and answered an impressive list of those wandering questions and published them in the FAQ section on their website. 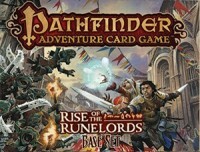 Available here, (http://paizo.com/paizo/faq/v5748nruor1gk). You should definitely take a peek. I personally found answer to questions I didn’t even have, yet. They also took all these answers and revised the rulebook based on them (available in pdf on top of the same page). A lot of “custom card setups” have cropped upon the internet to serve this game, from deck stands and boxes to mats and miniatures. Use a handy lazy susan, stacking the locations facing outwards in the centre. This can be a tough one, but I already owned a copy of Descent (2nd Edition) and it comes with a number of beautiful miniatures. There are some fairly obvious similarities between some of the characters in Pathfinder and some of the characters in Descent and its expansions. If you must buy the expansion to get the character that you want… well you’ve got ANOTHER phenomenal game to play! Natai on BGG has released some exquisite mats for use with most of the characters. You can A) print them or B) have them professionally printed/laminated! Your game night has suddenly been massively upgraded. Our solution is similar, we do not rebuild characters and we give the scenario reward also for the dead character (the team has won anyway!). But when rebuilding decks and trading between characters, the dead ones are out of the trade: they should rebuild their decks with their own cards and rewards, and if not possible they must complete with box cards according to rules restrictions. Just take it as ‘they are recovering from their injuries’. Seriously. Take them as literally as you can, and be a stickler with semantics. It sounds stupid at first, but it changed how I played the game. Almost immediately I was able to put the rule book aside and focus on the cards. You can play a card at ANY time, as long as it’s allowed by the card text. This means you also have to pay close attention to the cards’ use of indefinite articles and personal pronouns, “a check” vs “your check” and the like. There are certainly still some vague points, misprints, and omissions in the rules, but following those two phrases solved almost every question that has come up since I started playing. And if you’re still stumped, check the Paizo FAQ or hit their friendly forums! The game comes with “Token” cards for each character. The players place these token cards next to the various location decks to show that which character is at a particular location. I felt this was a little cumbersome, so I brought my Pathfinder Beginner Box miniatures out, and I use those rather than the Token cards to indicate where the characters are. The Beginner Box minis include four of the characters from the base game, and the others are available to buy, mainly on the secondary market. For some characters, I don’t have the correct mini, so I use a comparable proxy, it doesn’t add to the gameplay, but it definitely adds to the theme and makes the game look much cooler when you’re playing. I’ve played this game over 20 times in 2 weeks now with 2 and 3 characters, and have got all 11 characters through the first adventure Perils of the Lost Coast. I’ve tried starting directly on Burnt Offerings adventure with a few characters (adventure add-on nr 1, that comes with the game), but had a hard time with some really hard mobs/barriers. For doing the 3 scenarios in Perils of the Lost Coast adventure you’ll get one random item, one random weapon, one random boon (weapon, spell, armor, item, ally, blessing) AND one ‘skill feat’. In addition you’ll also get to keep the boons you are aquiring, to build you a better deck. Burnt Offerings wont be a walk in the park (maybe a few of the scenarios), but it will be much more handable. If you don’t want to mark up your cards as you level up your characters from game to game, Paizo provides free printable character sheets on their website that you can use instead. Try to team up a way that give you magical capabilities. Some monsters can only be beaten with weapons with ‘magic’ trait and you don’t find many of them with the starter setup. One physical hitter and one spellcaster might be one way of doing it (Sajan starts with Amulet of Mighty Fists which gives him melee with the ‘magic’ trait). Even if the rules say that you can take a card that you don’t have any chance of beating and switching it with a similar one, it just doesn’t feel right for me. I’ve played through the first scenario 4-5 times and the first adventure 2 times. I always start with closing an ‘easy’ location or a location that have boons that are useful for your character. That way you will have more possibilities picking up boons that will help you in your further adventure. In order to improve the storytelling aspect of the game and to make the game more immersive, you can change the way monsters are added to each of the location decks. First; separate out the monster into 4 or 5 sub-categories of monsters. This can easily be done using the classifications on the left hand side of the card. I separate them into goblins, animals, humans, beast men, undead, however, you can use your own classifications or understandings of these categories. For example; in the scenario Brigadoons, shuffle the “human” monster sub-deck and place the 4 required monsters for the “Waterfront Harbour” location from the “human” monster deck. This way as you explore the port you will encounter some nasty brigands and not a freaking hill giant standing in the middle of the city. This is especially true of locations like shops where you should encounter some brigands, and not a*-hound hiding in the closet. This will also prevent you from fighting an undead infestation when you should be hunting brigands according to the scenario card. Finally you can make things a little more interesting by taking any number of “possible encounters” for a specific location and shuffle them into the selection deck for that specific location. For example you may add Bunnyip, Rat Horde or Giant Gecko to the Waterfront Harbour location “human” monster sub-deck. This game is pretty notoriously easy, particularly when playing with a full party. You just spread out and individually work on closing locations, right? This also minimizes the risk of traps and enemies that deal damage to all characters at a location. To offset this, make the game a little more difficult, and force a bit more cooperation between party members, we use a house rule that all players start at the same location (determined by numbering each location and rolling a die), and that party members can’t be more than two locations away from the members farthest from them. This makes it more likely that you’ll still be working with someone to close a location, can make it more difficult to keep the boss from escaping, and increases some of the risks of being together, while still allowing Harsk to use his ability to help characters at other locations and Merisiel to use her ability that requires she be alone. It’s not a perfect fix, but it certainly helps. I’ve played The Skinsaw Murders with 2 characters now and want to get my other characters up there so they can also do this adventure. I’ve left all the cards in the big box (not putting them back in the addon box which the rules say). I currently play Burnt Offerings and if I encounter a boon or a bane from Skinsaw (numbered 2) I simply draw a random card of the same type replacing it. The same thing can be done the other way around; i.e. if you play The Skinsaw Murders and encounter a Goblin Raid barrier, switch it out with the Zombie Horde barrier from Skinsaw instead. This way you don’t have to sort the cards in and out the addon boxes when playing different characters and different quests. I’ve also tried not doing this but instead encountering a card from Skinsaw when playing Burnt Offerings. This may let you get a better deck faster, but I’ve seen that I more often encounter a bane than a boon when doing this. The theme of the current adventure will also more or less vansih doing this. I’ve seen people complain on different forums about the theme of the game when encountering a sea creature while a on land location; just draw a new random card and it should be solved. This might not work when we see the 4th and the 5th adventure addon. There are a bunch of strange synergies in the game that can help you out. For example, there is an ally that lets you deck-peek at the locations, but the downside is there is a 1/12 chance of encountering a super-boss. Give this card to Merisel, who can choose to evade any encounter. Father Zantus is a great card for Kyra. It’s tempting to bury him for a heal, but you are better off discarding him for the divine trait and using Kyra’s innate heal ability, or recharging him to gain the +d4 on a divine check when recharging a spell.